TUALATIN — Hard work pays off. 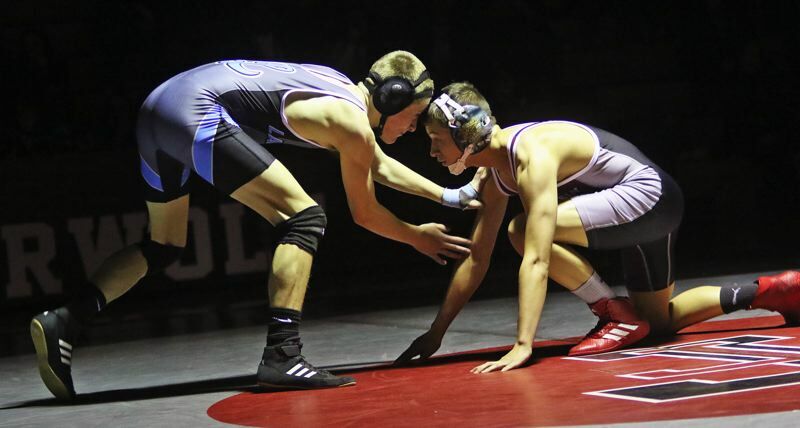 For the Tualatin High School wrestling team, that looks to be more than just a cliché. The Timberwolves really seem to be taking that to heart. And, well, their hard work definitely seems to be paying off. 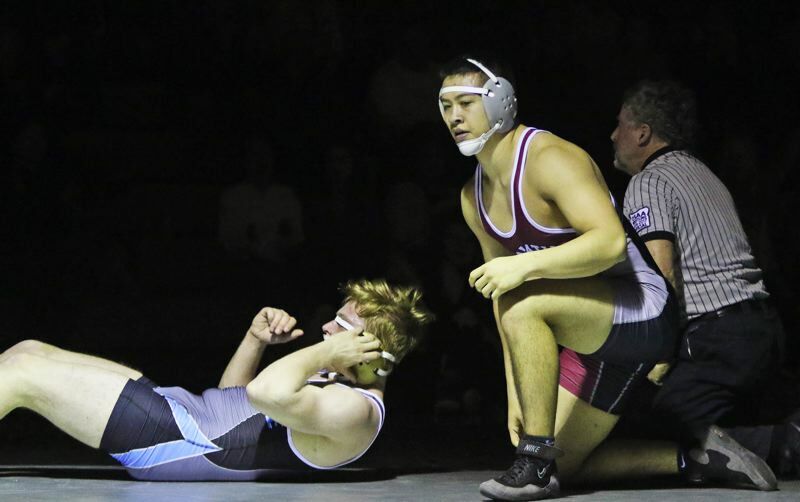 It certainly seemed to be a factor in Tualatin's 60-15 win over Lakeridge in a Three Rivers League dual match held last Thursday in front of a Senior Night crowd at Tualatin High School. 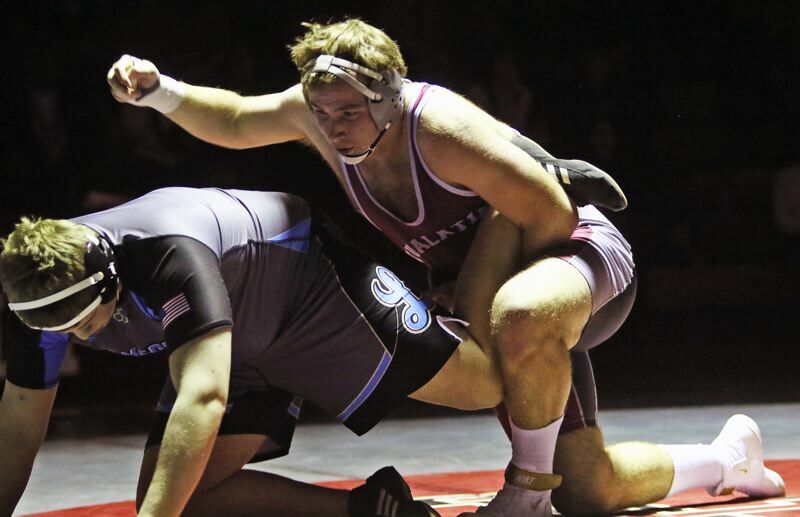 "It went pretty well," said Tualatin senior Justin DiCola, who rallied from an early deficit to win by fall at 195 pounds. "Definitely, we were in better shape than they were, it seemed like. We were pushing the pace. Coach (Matt Hamilton) told us from the beginning that we needed to get hands on, and push the pace." 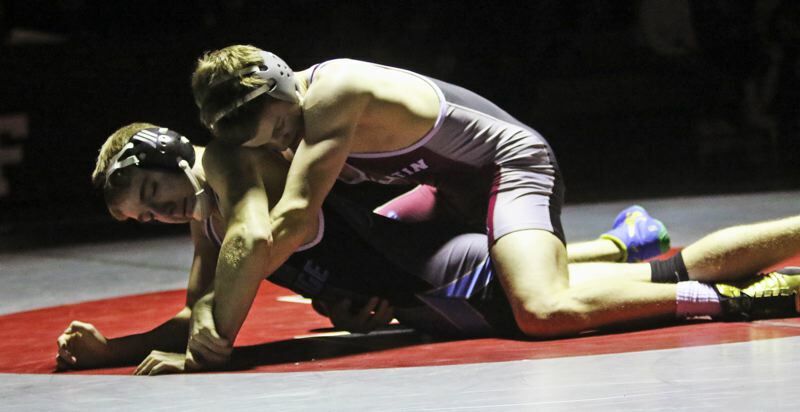 "I think it went very well," said Tualatin senior Connor Lennehan, who won by fall at 138 pounds. "For the team, it's a great way to end (the home schedule), and, for the seniors, we're happy with that. For my senior year, going out with a pin, and the many of the other seniors, to go out with a pin is just a confidence booster." With the loss, Lakeridge moved to 1-4 in league matches. Tualatin improved to 3-2 in league duals with the victory. 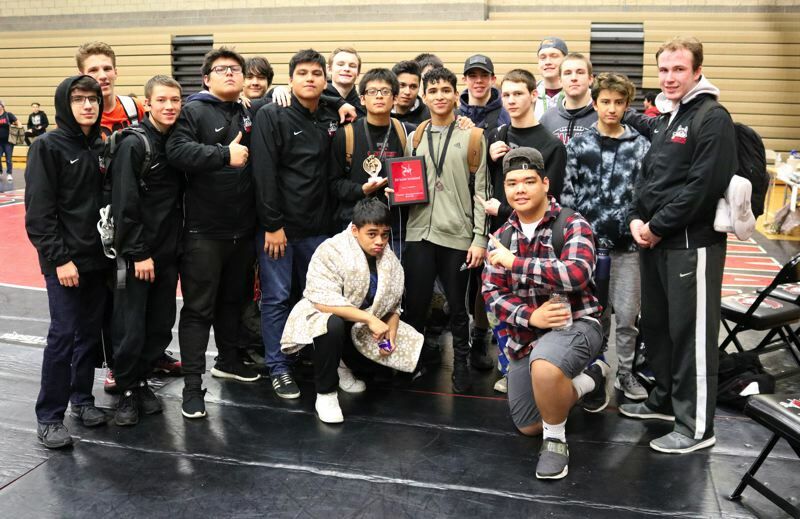 The Wolves followed up the win over the Pacers by winning the team title at the Bill Geister Invitational, held Friday and Saturday at Clackamas High School. The victory marked Tualatin's fifth tournament championship of the season. "We have a large senior group, with a lot of leadership on the team," DiCola said of the team's run of success. "This team, of my four years here, I've really appreciated the most, because of all of the support. We're always building each other up." "I think it's the grit that we're putting in when we're in the (wrestling room)," Lennehan said. "To see how hard we work in practices, and the momentum we have, we're just getting better and better. We're outworking everyone. All of the hard work is paying off." It certainly seemed to in the TRL dual match with Lakeridge. The Pacers actually took the first lead of the night, at 6-0, after getting a pin in the opening 106-pound match. But Tualatin took over — in a big way — after that." Timberwolf senior Argenys Abarca-Lopez pinned Lakeridge's Matthew Crockett in a time of 54 seconds in the 113-pound match, tying the team score at 6-6. Sophomore Chad Kailiui then gave the home team a 12-6 lead by defeating Lakeridge sophomore Ronan Chapman by fall, in 0:44, at 120 pounds. At 126 pounds, Tualatin senior Sami Victoriano had three takedowns, a reversal and a 2-point nearfall on his way to getting an 11-4 decision win over Cole Brink. Sophomore Josiah Ingham then received a forfeit victory at 132, upping the Wolves' lead to 21-6. Lennehan, at 138, followed by pinning Lakeridge junior Zach Nyman in 1:29 in his final home match. "This is the last time I can ever wrestle at home, and going out with pin made me happy, and with the team being able to step up, as one, and get a win was really enjoyable," Lennehan said. At 145 pounds, Tualatin junior Noah Brooks won by fall in 2:49, giving the Wolves a 33-6 lead in the team score. 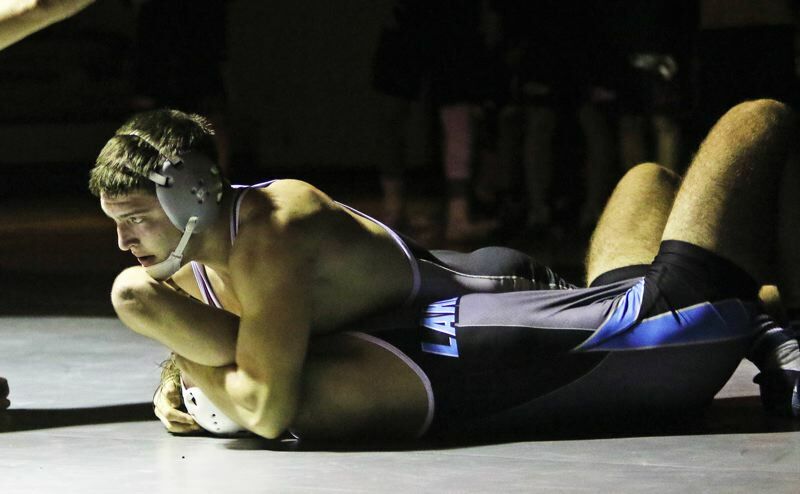 Lakeridge answered back with a decision win at 152, and a victory by fall at 160, cutting the Tualatin lead to 33-16. But the Wolves would pull away again from there. At 170 pounds, Tualatin senor Christian Bostick got a 6-5 decision win over Lakeridge senior Jared Bartunek. The Wolves then scored back-to-back come-from-behind wins by fall. At 182, Tualatin junior Cody Van Meter trailed Lakeridge senior Jonas Crowder by a 5-3 score going into the third round. But, in the final period, Van Meter scored on an escape and takedown before pinning Crowder at the 4:58 mark of the match. Then, at 195, DiCola faced an early 2-0 deficit before coming back to pin Lakeridge senior Nolan Russell in 3:40. "I was not used to the collar tie. Most of the time, I like shooting from the outside. So I had to adjust to that," DiCola said. "But, once again, coach has us in the (wrestling) room, pushing the cardio. Once I was able to get my head back into the match, I was able to get my cardio going and set up some shots." Tualatin senior Dane Norlin won by forfeit at 220 pounds, and Timberwolf senior Gavin Moore pinned Spencer Lenius in 1:09 at 285, wrapping up Tualatin's 60-15 team victory. "We have the team mentality that no matter who we're going against, or no matter what night it it, we want to push," DiCola said. "This was very fun," Lennehan said. "Whenever someone got a win, the whole bench lit up." At the Bill Geister Invitational, Tualatin took first place in the 25-school event with a score of 166.5 points. Lakeridge finished second at 159.5. Victoriano won a tourney title at 126 pounds. He scored a 4-1 decision win over Cole Brink in the title bout. DiCola triumphed at 195 pounds. He again pinned Russell in the championship match, this time winning in 4:40. 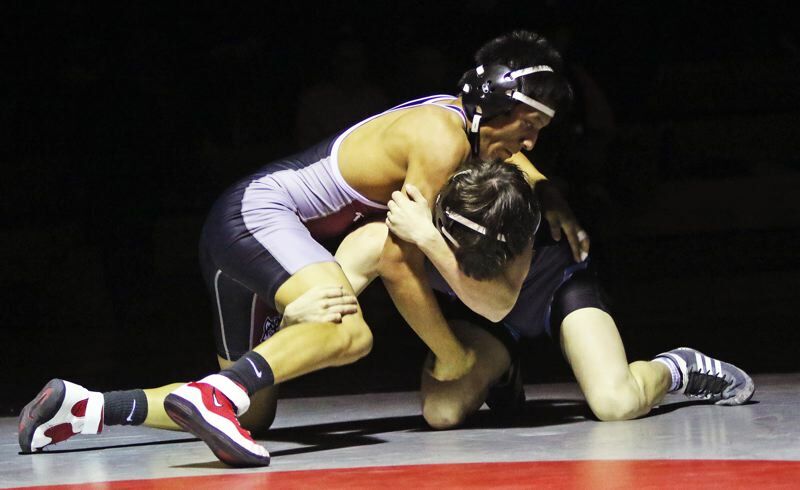 Tualatin will finish its league dual match schedule on Thursday when it travels to Canby. Varsity matches are set to start at 7 p.m.